The new Audi A8 is the forward-thinking luxury sedan that’s taking the roads by storm. Forget everything you thought you knew about luxury vehicles. It’s a new day, and the Audi A8 is changing the full-size luxury-sedan game. Storming onto the scene with a sculpted body, flared fenders, and distinctive lines, the Audi A8 demands your undivided attention. Audi even redesigned its iconic Singleframe® grille, making it lower and wider, giving the A8 a sportier vibe. Slip behind the four-spoke steering wheel and discover an interior as luxurious as the outside. The dashboard inlays and premium leather seats add to its sense of elegance while the available Audi air-quality system ensures you breathe easy. With its heated front seats and four-zone climate control, you’ll travel in the pinnacle of comfort whether you’re commuting to Irondequoit, dropping the kids off in Fairport, or meeting friends in Webster. There’s more to the Audi A8 than just its good looks. Press the accelerator and awaken the powerful 3.0-liter turbocharged V-6 engine. This beast of an engine boasts up to 335 horsepower and rockets this luxury sedan to 60 mph in just 5.1 seconds. Factor in quattro® all-wheel drive, and the A8 is more than prepared for whatever Mother Nature throws your way. Stop waiting to fall in love with the new Audi A8. 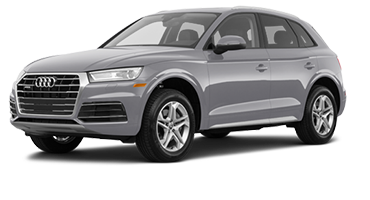 Schedule a test drive today at Audi Rochester. Elegant style follows you everywhere in the new Audi A8. 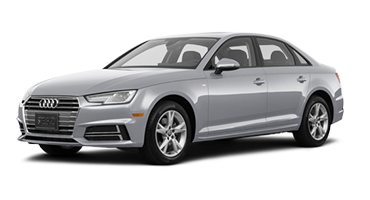 Audi crafted this luxury sedan to leave a lasting impression with its dynamic LED lights, eye-catching color palette, and sleek lines that invoke a feeling of forward momentum. Audi crafted the A8 with an emphasis on forward momentum. 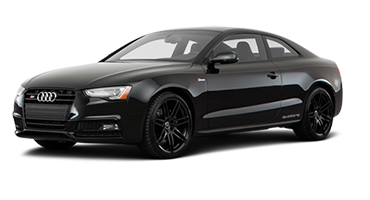 The A8 grabs your attention and holds it with its sculpted body, distinctive crease, and gently flared fenders. 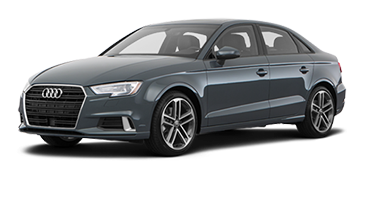 Up front, Audi also redesigned the iconic Singleframe® grille, making it lower and wider for a sportier presence. 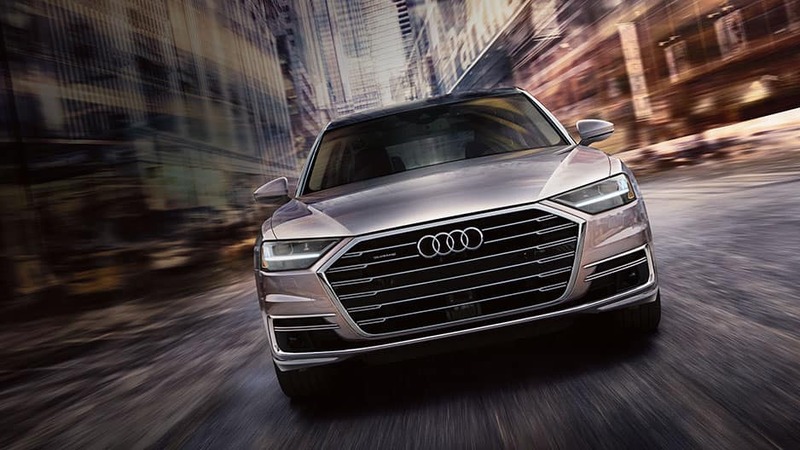 Light up the night in the new Audi A8 with the available HD Matrix-design LED headlights that cast bright lighter farther down the road than traditional halogen bulbs. In the rear are LED taillights with dynamic turn signals that broadcast your movements to the vehicles behind you. Up your curb appeal in the new Audi A8 by opting for the available 20-inch wheel package. This package adds 20-inch multi-V-spoke design wheels that ensure this luxury vehicle gets heads-turning, even at a standstill. Cold weather is no match for the new Audi A8 with heated side-view mirrors. You can activate this innovative feature along with the rear defroster to guarantee a clear view from every angle. Whether you prefer a classic Mythos Black metallic or the eye-catching Navarra Blue, Audi offers the A8 in 10 color options, painting a sophisticated picture. Sit back and enjoy the ride in the new Audi A8. This stylish sedan feels like your home away from home, boasting interior luxuries you want like heated front seats, a panoramic sunroof, and four-zone automatic climate control. Audi’s forward thinking vision is evident all around the A8’s interior. The sculpted, expansive dashboard houses two touchscreens and features decorative inlays. Factor in the leather seats, four-spoke steering wheel, and chrome accenting, and you’ll want to take the long way home. The new Audi A8 wraps you in warmth and comfort with its standard heated front seats. Press a button to warm the cushion and seatback to keep the morning chill outside where it belongs. Everyone rides comfortably in the new Audi A8 with its four-zone automatic climate control. This standard system allows you, your front passenger, and the rear passengers to each choose a temperature setting. Let the sun in with the Audi A8’s standard panoramic sunroof. The front panel slides back with the press of a button to allow fresh air in, or activate the blackout sunshade when it gets too bright. 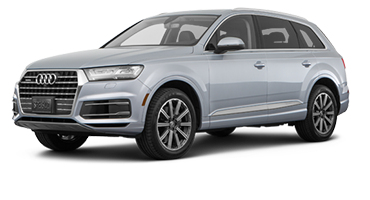 With the Audi A8’s available air-quality system, you’ll ride in a cabin free from dust, allergens, and other air particles. The system features an air ionizer that releases negatively charged molecules into the air so you can breathe easy. 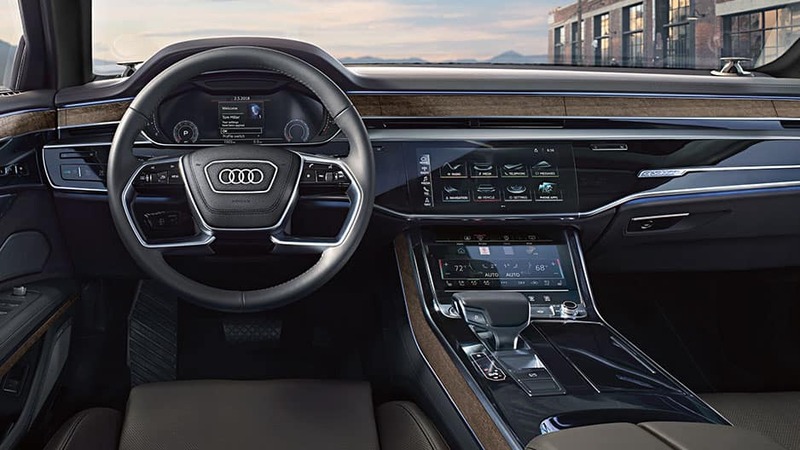 Audi ensures boring road trips are a thing of the past in the new Audi A8 thanks to its plethora of advanced technology right at your fingertips. Sync your mobile device, pump up the volume, and let yourself get carried away. The new Audi A8 makes it easy to stay connected on the go with smartphone integration via Apple CarPlay™, Android Auto™, or Bluetooth®. Sync your compatible device and enjoy easy access to hands-free calling, audio streaming, and turn-by-turn navigation right from the touchscreen. With the A8’s available Audi connect system, you’ll never miss out on a thing again. 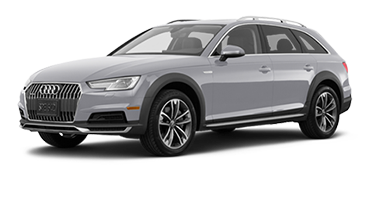 Audi connect turns this luxury vehicle into a mobile 4G LTE Wi-Fi® hotspot, keeping your smartphone connected to the internet while providing information such Google Earth™ navigation, current weather, and up-to-date traffic conditions. The new Audi A8 surrounds you in clear, concert-quality sound with its Bang & Olufsen Premium 3D Sound System. This system features 17 speakers throughout the cabin, turning the Audi A8 into an audiophile’s dream. Audi takes futuristic design one step further with the Audi Virtual Cockpit. This system provides a 12.3-inch high-resolution display screen where the traditional gauges would be, allowing you to choose between a traditional speedometer layout or an infotainment layout that includes a navigation map. Keep passengers in the rear entertained on long drives with the Audi A8’s available Rear Seat Connectivity package. This package provides two detachable 10.1-inch tablets connected to the front seatback that play DVDs and stream music through their USB ports. The new Audi A8 doesn’t hold back when it comes to your safety. 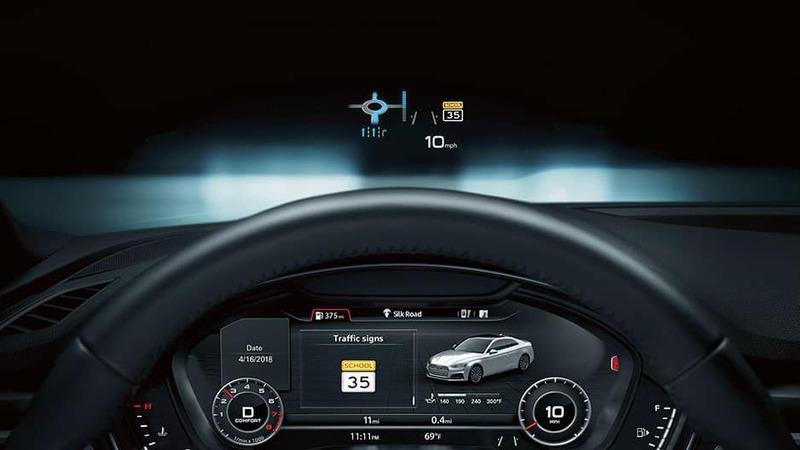 That’s why Audi has equipped it with the latest in advanced safety features, including adaptive cruise control, active lane assist, and the surround-vision camera, so you always have peace of mind. Using radar technology, the Audi A8’s adaptive cruise control can maintain a set distance from the vehicle in front of you. If the A8 approaches a slower vehicle, the system automatically slows down to maintain that distance, and will accelerate back to cruising speed when the vehicle is no longer present. With active lane assist, the Audi A8 can detect unintentional lane drift on roads with defined markings. If it detects lane drift, the system will alert you with steering assistance and audible warnings to get you back on track. The Audi A8’s available turn and intersection assist uses cameras and radar sensors to detect oncoming vehicles before turning. If it detects a vehicle, the system intervenes by applying the brakes and issuing a warning. Parking has never been easier than with the Audi A8’s Virtual 360-degree camera. This system uses radar and camera technology to paint an overhead view of the A8, and it allows you to zoom in on specific areas. It also provides alerts of potential obstacles while performing tight parking maneuvers. The Audi A8 uses radar and cameras to detect when you’re following the vehicle too closely. If it detects a front-end collision, the system will engage emergency braking while also providing both visual and audible warnings. While the Audi A8’s stylish good looks may have been what initially caught your attention, it’s the thrilling power and agile handling that keeps you coming back for more. Slip behind the wheel, put the pedal to the metal, and see where the road takes you. Audi paired the new A8 with an exhilarating 3.0-liter TFSI V-6 engine. 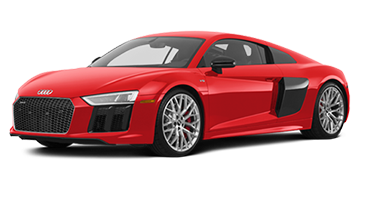 This turbocharged engine kicks out 335 horsepower and 369 pound-feet of torque, sprinting the A8 to 60 mph in less than six seconds. Audi equipped the new A8 with an eight-speed Tiptronic® automatic transmission, ensuring smooth shifting that firms up under harder throttle. Let nothing stand in your way in the new Audi A8 with its legendary quattro all-wheel drive. This system distributes power between all four wheels evenly, ensuring an even grip and more traction across all road conditions. Fine-tune the Audi A8’s performance to how you want to drive with Audi drive select. This system allows you to choose from Comfort, Dynamic, Auto, or Individual to adjust ride quality and performance to your taste. No matter what twists and turns the road throws at you, you can feel confident in the Audi A8’s ability to handle it with its adaptive air suspension. This five-link system helps the A8 grip the road, ensuring maximum control. You work hard — reward yourself, with the new Audi A8. 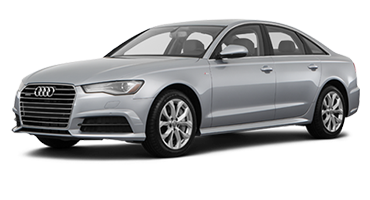 Audi didn’t hold back on luxury with this full-sized sedan, equipping it with the latest in advanced technology. Sync your mobile device to the MMI® infotainment system and stay connected on your morning commute. 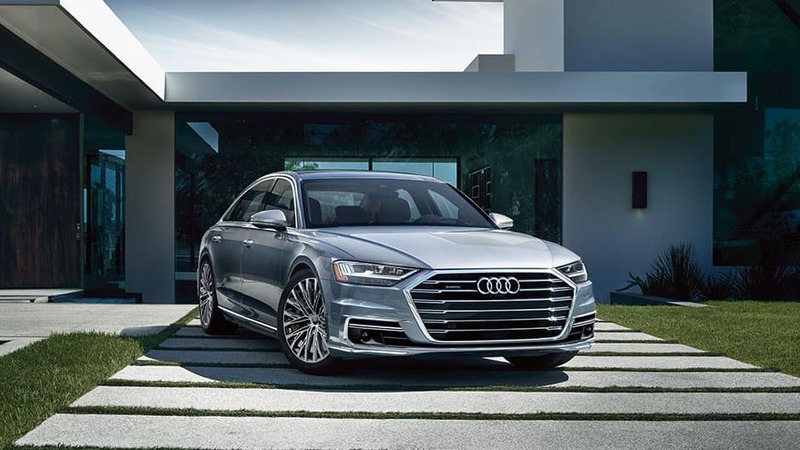 With 4G LTE Wi-Fi® via Audi connect® and the Bang & Olufsen® Premium Surround sound, the Audi A8 is ready for wherever the road takes you. 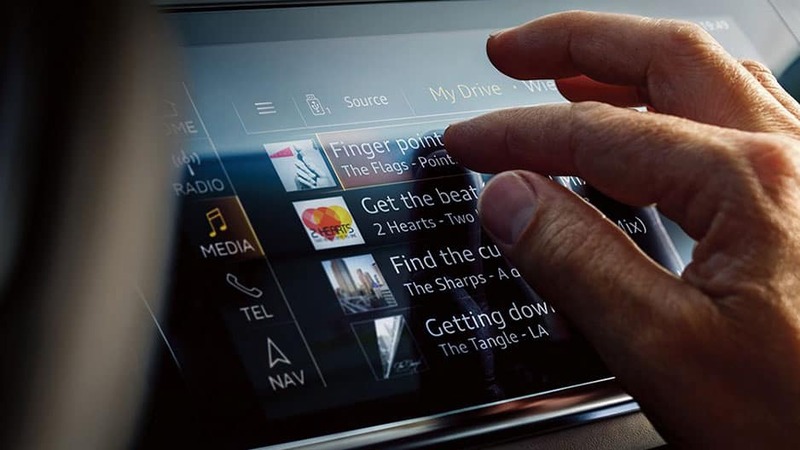 Audi put the power in your hands in the new A8 with Audi drive select. This system allows you to choose from four modes that fine-tune the Audi A8’s performance to how you want to drive. Select Comfort mode when you want the smoothest ride possible or Dynamic when you crave responsive performance. These are just a few of the ways the new Audi A8 has your wants and needs in mind. 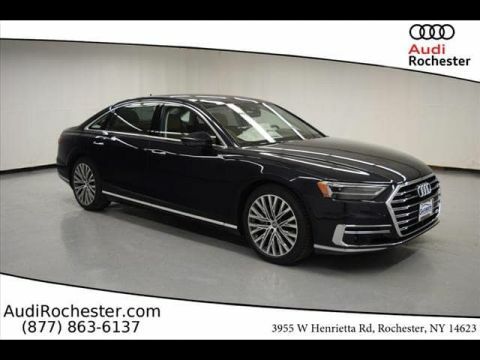 Experience the all-new Audi A8 for yourself today, by scheduling a test drive with Audi Rochester. 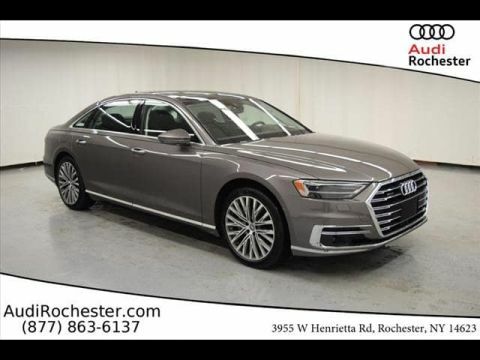 *MSRP: Starting MSRP of $83,800 for a 2019 Audi A8 V6 with automatic transmission. Model shown is a European model with available equipment. 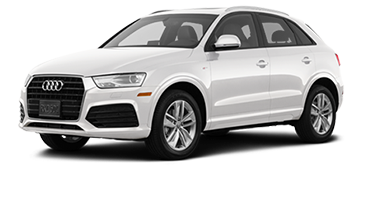 Prices exclude $995 destination, taxes, title, other options and dealer charges. Dealer sets actual price. *Fuel Efficiency: 19 city/29 highway mpg. EPA estimates. Your mileage will vary and depends on several factors including your driving habits and vehicle condition.